One of my favorite, natural beauty "must have" products is Josie Maran's Argan Color Sticks. I own three colors as well as the clear balm. So what are these lucious, glossy color balms and why do you need them? Their an argan oil infused, glossy color balm that gives you a beautiful, sheer tint you can use on your lips and cheeks! They come in super flattering colors and look great on every skintone and every age. Their packed full of good for you ingredients, like argan oil, cocoa, shea, avacado and mango butters. Their also paraben and fragrance free, and never cause any breakouts or irritation. They come in three colors for your lips and cheeks (Petal Pink, Rosey and the newest color Pink Peony). There is also a Clear multi-tasking balmyou can use on the go for your face, body and hair! What I love about these argan color balms is you get the most beautiful sheer wash of color and it's truely natural beauty on the go! You can buy them online at Amazon.com, JosieMaranCosmetics.com Sephora.com, or in your local Sephora stores. 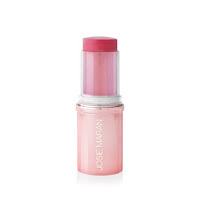 Click here to watch Josie Maran show you what her beautiful argan color sticks look like.